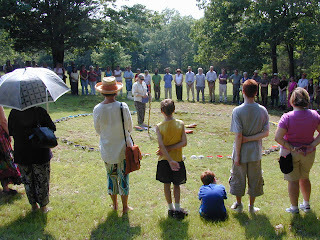 is a ritual artwork facilitated by artist Mary Anne Davis. It is a an interfaith, intergenerational ceremony that seeks to create community, dispel myths of scarcity and empower sustainable living. 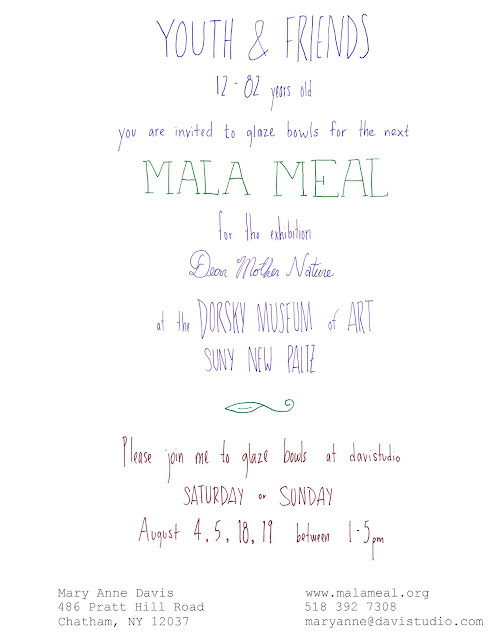 We met our funding goal on Kickstarter and the Mala Meal Project took place on the SUNY New Paltz campus in association with the Dorsky Museum of Art on Saturday, August 25th! 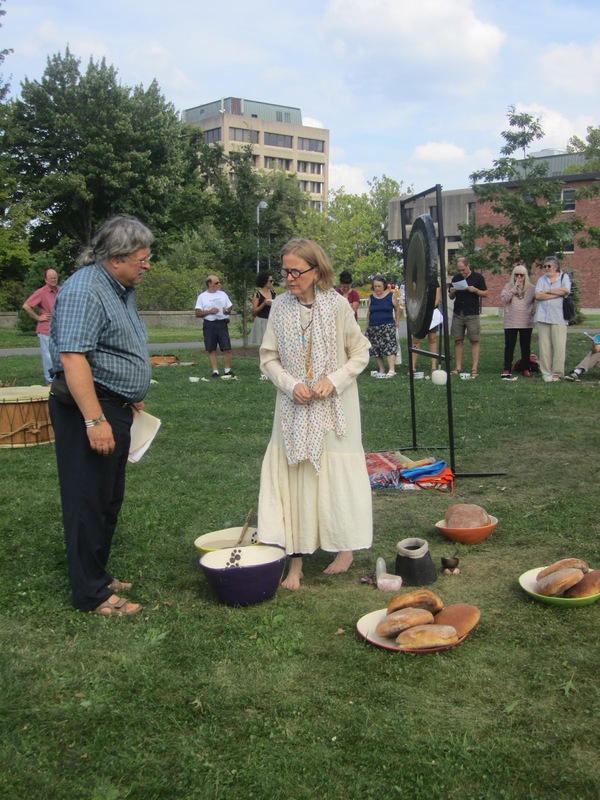 Representatives of different faiths offered blessings, and a delicious, locally grown organic meal was enjoyed by all, in ceramic bowls produced by davistudio and painted by members of our community here in Chatham, NY. Thank you to all those who participated! If you missed the Mala Meal Project this go round, have no fear; we will be orchestrating other opportunities to share an interfaith, communal meal in the future, and we hope for many meals yet in the spirit of the Mala Meal Project! 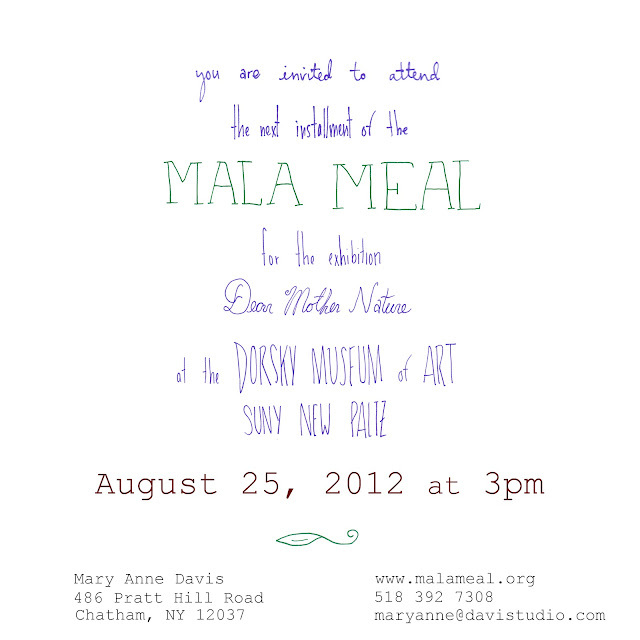 Come join us for the Mala Meal tomorrow! It will be a fantastic event with great food and great people. We hope to see all of you there! PARKING:All students, faculty, staff, and visitors who wish to park on the SUNY New Paltz campus must have a valid parking hangtag or visitor permit. * 24-hour visitor parking permits are available at the Welcome Center located in the Haggerty Administration Building lobby and from the Parking Office located in Haggerty Administration Building 35. Park and pay machines are also located on Hawk Dr. at the West entrance, in the Elting Main parking lot number 5, and in Lot 28 across from the Hopfer Admissions and Alumni Center. From Rt. 299/Main St. go .6 mile south on Rt. 32 to Southside Loop. Turn right. At the second stop sign 'T' intersection, turn right and pass the Athletic & Wellness Center. Park in the Elting Main Parking Lot number 5. From Route 299/Main St., go .7 mile south on Rt. 208. Turn left onto Hawk Drive. At the stop sign 'T' intersection, turn left. Continue past the Athletic & Wellness Center. Park in Elting Main Parking Lot number 5. ACCESSIBILITY: All galleries and restrooms are wheelchair accessible. Today is an exciting day, we have lots of progress ongoing for the food of the Mala Meal! Yesterday we picked up produce from Little Seed Gardens and The Farm at Miller's Crossing. Little Seed Gardens is a 97 acre family run farm located in Chatham, NY and is owned by Willy Denner and Claudia Kenney. They own a CSA and together with their two children they tend vegetables, and cover crops and pasture. The farm at Miller's Crossing, located in the Hudson Valley of New York, is owned by Chris Kashen and Katie Smith. They also own a CSA and grow organic vegetables, plants and flowers as well as raise a small beef herd. Both farms graciously donated ingredients for tomorrow's Mala Meal that are being worked into preparation today. The menu is shaping up to be coleslaw courtesy of Sarah Bassin, who will also be performing the gong ceremony during the Mala Meal, and a wheat berry salad courtesy of our friend Chef Robin McKay. In addition to this we are also preparing beet salad, zucchini salad, roasted fingerling potatoes and roasted kabucha squash, all made from local ingredients! Phillip Patterson is also working on baking bread made from Wild Hive Farm grain, sourced in Columbia County. And on Wednesday we received 108 brownies from Greyston Bakery, located in Yonkers, NY. Everything is coming together beautifully, it should be a fantastic event tomorrow! Hope to see you there! Only $400 to go with less than 72 hours left! We have almost reached our goal and now we're going for the final push. If you know anyone else you could recommend who might be interested in supporting our project or if you were considering increasing your donation, now is the time to do so! Thank you so much for all your help! On another note, we have a few updates about the dinner! As part of Mala Meal, we will be using 25 lb. of locally grown whole rye flour as the main ingredient for bread that will be baked by our friend Phillip Patterson. Wild Hive Farm will be our source, a great farm from the Hudson Valley who buy their grains and produce exclusively from local and regional farmers. 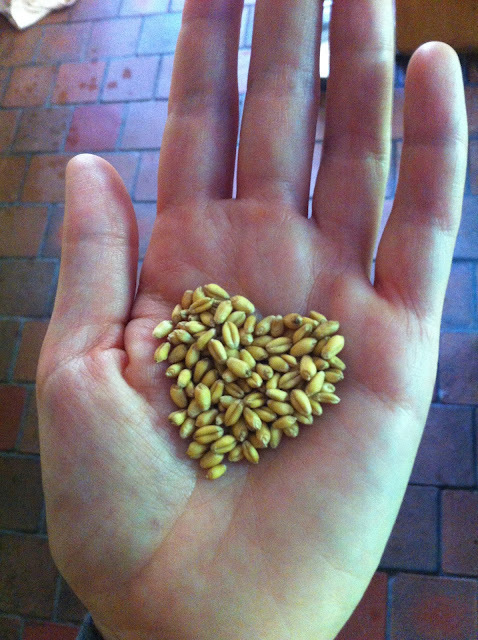 Wild Hive Farm is a grain grower and grinder in Clinton Corners, NY. One of the points of the Mala Meal Project is to source food locally as much as possible. 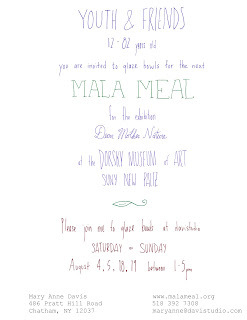 When we first did Mala Meal 10 years ago, there was not any grain available locally. The only grain was the rye or wheat farmers used to overwinter their crops but those were turned under for fertilizer, never harvested. In ten short years we have a thriving business that is focused on grain. We are using their wheat flour to bake bread for the participants in this year’s Mala Meal. It is fresh, local and comes form the fertile soil in the Hudson River Valley. A testament to the continuing journey toward sustainability that so many of us are on. We have also received our napkins in the mail! As the Mala Meal is eaten with one's hands, the napkins are an important part of the experience. They are beautiful, handmade, and 100% organic cotton. Michelle, owner of the shop gnomeclothes on Etsy, put together 108 napkins for us so that we would have them in time for the dinner. She then proceeded to donate back 10% of the costs into our Kickstarter fund. A very warm thank you to Michelle! 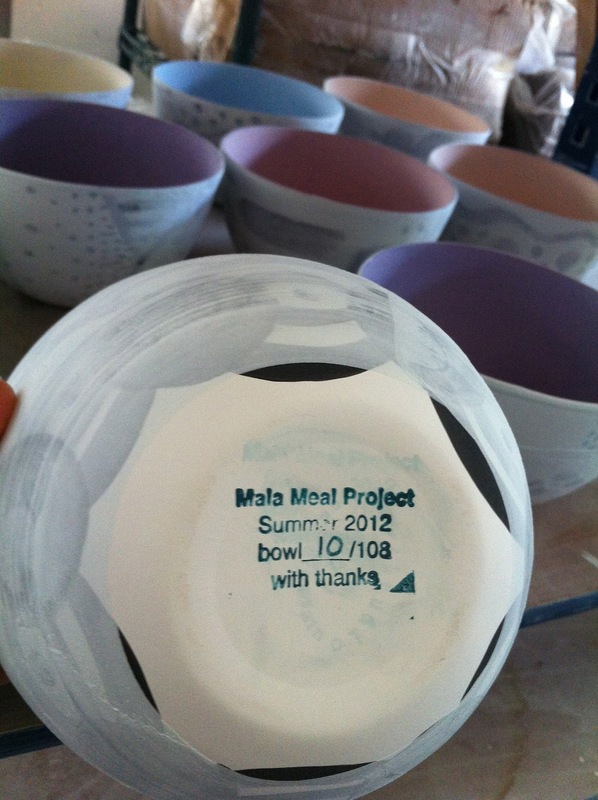 With Mala Meal quickly approaching in only a week from tomorrow, this coming weekend will be our last bowl glazing session! If you're in Upstate NY either Saturday or Sunday come get involved and join us from 1 to 5PM at davistudio to glaze a few bowls! Call us to confirm or if you have any questions at 518.392.7308. Finished Mala Meal bowls from the August 4 & 5th glazing sessions after they've come out of the kiln. They're looking beautiful! 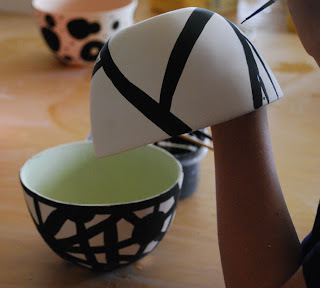 Our glazing sessions this past weekend were very successful. We had many different hands come into the studio, both new and old. Thank you to all of those who were able to make it and share your talents. We hope that you can join us at davistudio for the next sessions on August 18 & 19. One fun way to participate in the Mala Meal project is to come to the studio and glaze a bowl or two. We need to glaze 216 bowls between now and August 20th, so come on over! 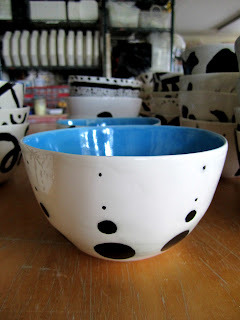 We've already had visitors - and in fact have 11 bowls ready to go into the kiln. We got approval today from Kickstarter for fundraising! Hooray! Check it out here -- This is a very cool way for artists to raise money for projects. It allows a "crowd sourced" funding to happen. I am thrilled and excited. 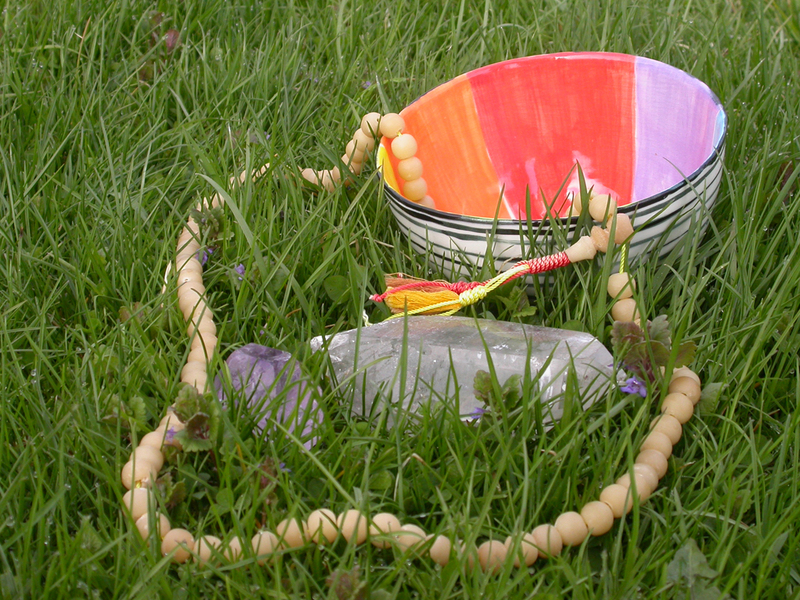 It means Mala Meal will be my main focus for the next 30 days. Check out the video. Leanne Shunney helped me with concept, filming and inspiration. Mala Meal as opening convocation for Earth and Religion Conference, 2005. 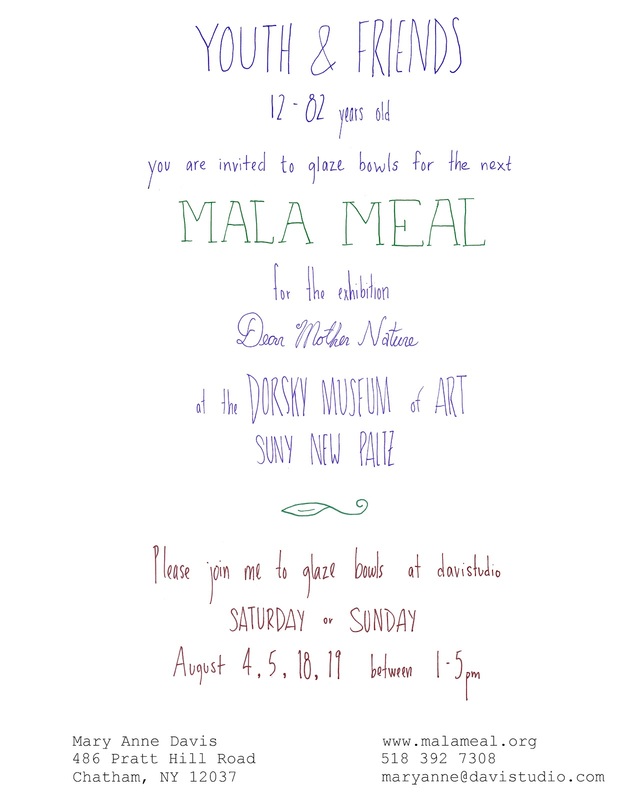 The next iteration of the Mala Meal Project will be held at the Dorsky Museum of Art at SUNY, New Paltz as part of the Dear Mother Nature exhibition curated by Linda Weintraub. Weintraub has been dedicated to art that engages the enviroment for many years. Her books, including Art on the Edge and Over and In the Making, highlight art that takes risks and evolves out of deep passion. Her recent series of short texts - Avant-​​Guardians: Textlets in Ecology and Art, are mini-​​textbooks designed to demonstrate how art connects to the planet’s wellbeing. She is the founder of Artnow Publications. The event will take place on August 25th at 3PM. It will take place outdoors and will include a meal comprised entirely of local food. 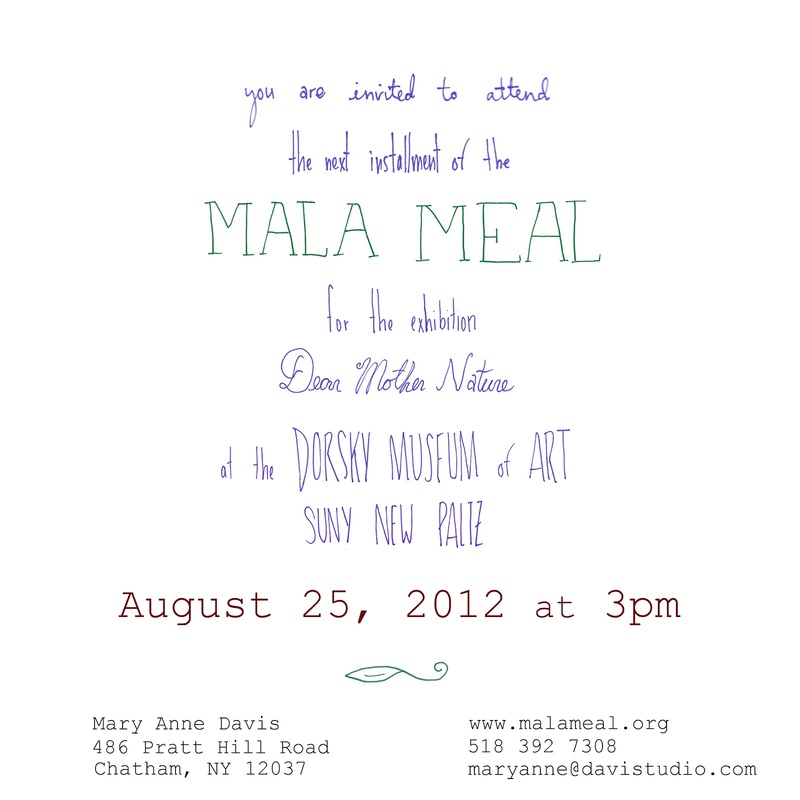 Mala Meal Project by Mary Anne Davis is licensed under a Creative Commons Attribution-Noncommercial 3.0 United States License. Artist, wife, mother, sister, daughter, friend, human seeking to live at a higher level.